Are you dealing with worn down, damaged, cracked, decayed, or missing teeth? Dental crowns and dental bridges can restore your tooth or teeth with functional and aesthetically beautiful results. Both crowns and bridges are custom-created to fit over your natural teeth, replacing and restoring the tooth’s surface. At Gregory J. Toone, DDS, Dr. Toone offers dental crowns and dental bridges for patients who need dental restorations. Dr. Toone is a skilled cosmetic dentist, and he will ensure that your treatment meets all of your cosmetic goals, so that your smile looks natural and beautiful. We specifically use non-metal material to create dental crowns and bridges, so your results look as natural as possible. A dental crown, sometimes referred to as a dental cap, covers the entire damaged tooth, completely replacing the tooth’s enamel. Dental crowns are created from impressions of the damaged tooth, so it fits perfectly, like a real tooth. 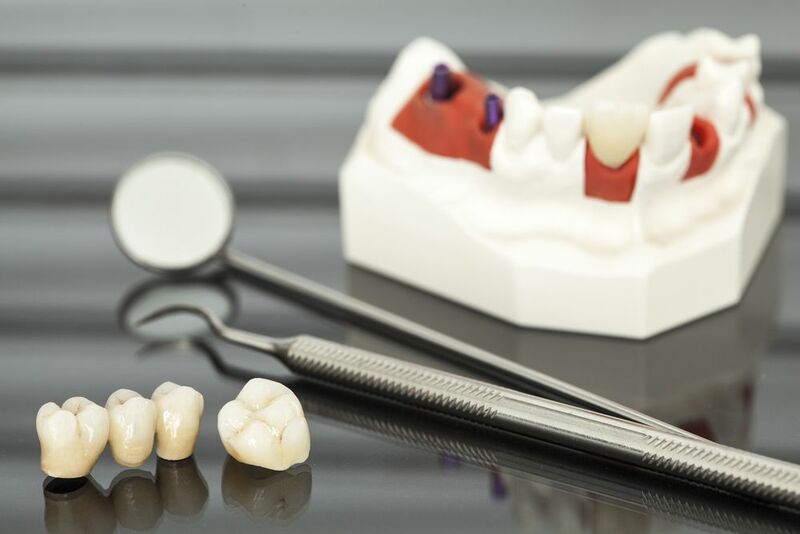 At Gregory J. Toone, DDS, we create our dental crowns out of porcelain, one of the most durable and natural-looking materials in restorative dentistry. Before attaching your dental crown to the damaged tooth, we might need to prepare the tooth by removing some of the enamel, so the crown fits over the damaged area without seeming too bulky. After preparing your tooth, we will cement the crown over the entire visible portion of the tooth. What Do Dental Crowns Treat? Dental bridges are a common restorative treatment used to fix missing teeth. As the name implies, dental bridges work by bridging the gap that is created by one or more missing teeth. A dental bridge consists of two crowns, which cover the teeth that are adjacent to the missing tooth, and the middle prosthetic tooth, known as the pontic. For a bridge, dental crowns serve as the anchors to the center false tooth or teeth. ​​​​​​​At Gregory J. Toone, DDS, we custom-create our dental bridges out of porcelain for a structurally sound and beautiful restoration that matches the rest of your smile. In some cases, a dental bridge might be supported by implants, rather than the neighboring teeth. The process for getting a dental bridge is fairly straightforward. First, the teeth adjacent to the missing tooth will need to be prepared by removing some of the enamel to fit the crowns over them. After the teeth are recontoured, we will take impressions of the teeth to serve as a model for creating the bridge. We will create a temporary bridge to protect your teeth and gums, while your permanent restoration is being fabricated. Once your permanent bridge is ready, we will invite you back to have it fitted over your teeth and cemented into place. When cared for properly, crowns and bridges can last a lifetime. However, sometimes they can come loose and fall out. One way you can promote the longevity of your dental restoration is by practicing proper dental hygiene. A bridge can come loose when the supporting tooth or bone holding it in place is damaged by dental diseases. You can keep the underlying tooth structure healthy by brushing and flossing twice a day with a fluoride toothpaste. At Gregory J. Toone, DDS, we will teach you proper brushing and flossing techniques to preserve your dental health and new dental restorations. Another way you can preserve your restorations is by being precautious when chewing hard foods, and avoiding chewing on ice and inanimate objects. If you suffer from teeth grinding, you can keep your restorations healthy by wearing a night guard while you sleep.